I actually shopped on Friday, but I was busy with my kids yesterday. They helped me shop this week, so there is a bit more than I usually get. Some things weren’t on sale, but the price was still good enough to get for dinners I wanted to make this week. 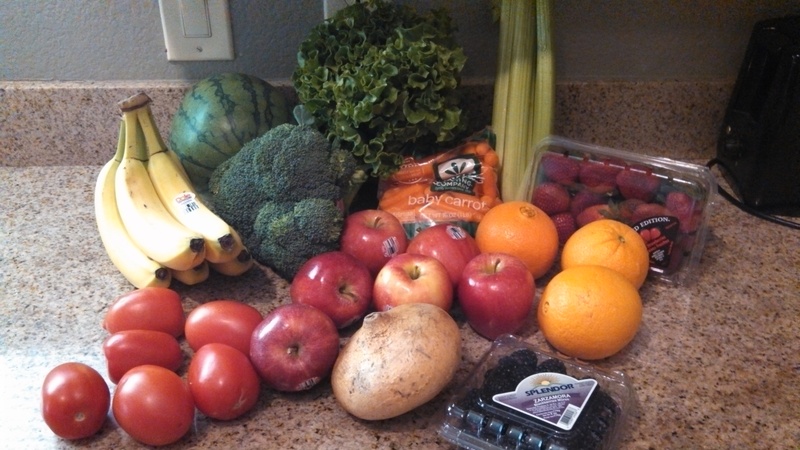 Still lots of good produce deals out there, hopefully it will continue for a few more weeks. WAY over budget this week, unfortunately, but, I also broke the #1 rule of deal shopping, never take the spouse and kids that aren’t deal crazy like you! I also did not buy much last week, just bananas, so this is the make up week. And, I will probably take it easy next week as well, just get a few things. 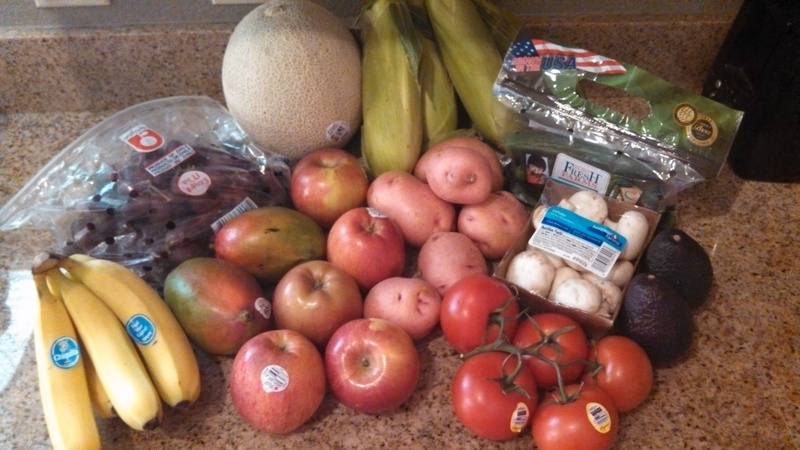 So, I haven’t made it to the store yet, but wanted to make sure to post about some great produce deals this week! These prices will be effective until Tuesday, June 4. Also, the Fry’s milk half gallons are $0.88/ea, with a limit of 4. Another good deal if you use the fuel points, is that all gift cards you buy will give you 4 times the fuel points. Kroger family store gift cards are excluded, but there are plenty of gift cards to choose from. With it being time for graduations and Father’s Day, it’s a great way to get extra points. Or, if you are working on some home improvement projects, stop in and get one for Lowe’s or Home Depot before you shop to get the fuel points. Fuel points can be used at Fry’s fuel stations, and select Shell and Circle K locations, and you can save up to $1/gallon (every 100 points earns $0.10 off per gallon) up to 35 gallons in one fill-up. You can learn more here. Safeway has 1 gallon of their Pantry Essentials milk for $1.89, limit of 2. Also, with summer here, Powerade is $0.49/ea, limit 15, to stock up on to keep hydrated on the hot days. Safeway is running a promotion for 2 times the gas rewards points on groceries after adding it on your card with the Just for U program. They are also running a 4 times the points when you buy gift cards as well. Best part? They have now expanded the gas rewards here to be not only at Safeway gas stations (which we didn’t have here), but also at select Chevron and Texaco stations. Glad to be able to finally use some of the gas rewards from shopping at Safeway. I did notice that the Chevron stations in town had roadside banners for the Safeway gas rewards program. You can learn more about the program here. Made it to the grocery store today! 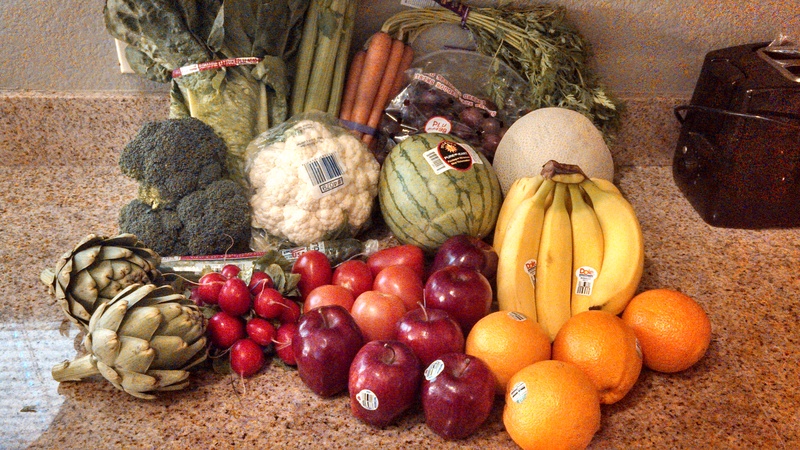 This week, I shopped at Safeway, but both stores had some nice produce sales again this week. Green zucchini or yellow squash at $1.49/ea. Lots of good deals there too. All these prices will be good through Tuesday, May 14. Like the title? I was trying to keep with my other titles like Basket Breakdown, Farmer’s Market Finds and FarmBox Fresh since I’m hoping to keep this up for at least a few weeks, maybe months. We’ll see. I haven’t gotten as much written lately as I would like, but life is busy and so it goes. 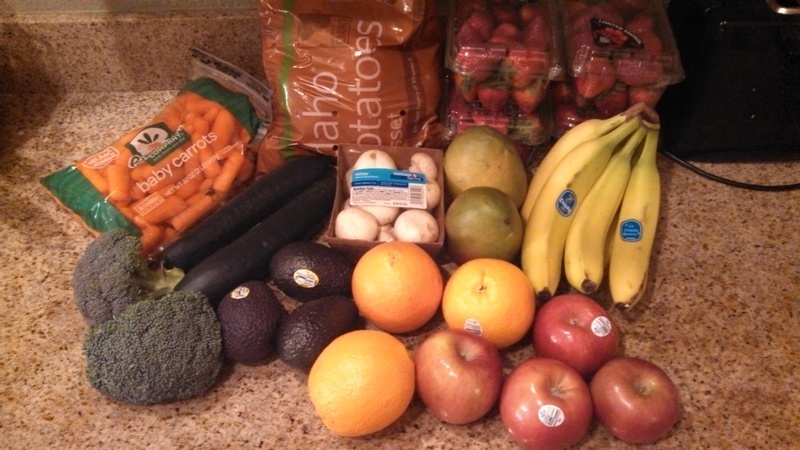 Anyway, I am way behind on the grocery sale cycle this week and finally got to at least Fry’s to get my weekly produce. I took both my girls, which is breaking the number 1 rule of bargain shopping – never take the family. Why? My kids think the produce section is like a candy store, and want everything. And, I have a hard time saying no to fresh produce! But, with the goal of $15-$20, we didn’t go over too badly. We did get a great variety of produce, though! The grapes and cauliflower are what made us go over. However, my older daughter was upset that I was hesitant, so I bought them anyway. Without those 2 items, I would have been at $18.51, $18.83 after tax. I also picked up some more shredded and sliced cheese at $1.88 and $1.99 per package, respectively. Other produce sales from the Fry’s ad include, 1 lb baby carrots at $0.99/ea, iceberg, red or green leaf lettuce at $0.99/ea, asparagus at $2.99/lb, 1 lb strawberries, 8 oz blackberries, or 8 oz blueberries at $2.50/ea, 1 lb organic strawberries at $2.99/ea, and organic 5-9 oz salad blends at $2.99/ea. I haven’t been to Safeway, but from their ad, they have 1 lb strawberries at $0.99/ea, red delicious or Gala apples at $0.99/lb, sweet white corn at $0.50/ea, red or black seedless grapes at $2.99/lb, red, orange, or yellow peppers at $1.25/ea, red or ataulfo mangoes at $1/ea, red or russet potatoes at $0.99/lb, Hass avocados at $1/ea, red seedless watermelon, locally grown 1 lb bag of baby-cut carrots at $1.50/ea, locally grown tomatoes on the vine at $1.99/lb, and locally grown 1 lb bag mini Persian cucumbers at $1.99/ea. I may have to make a stop at Safeway to pick up a few of the produce deals there. 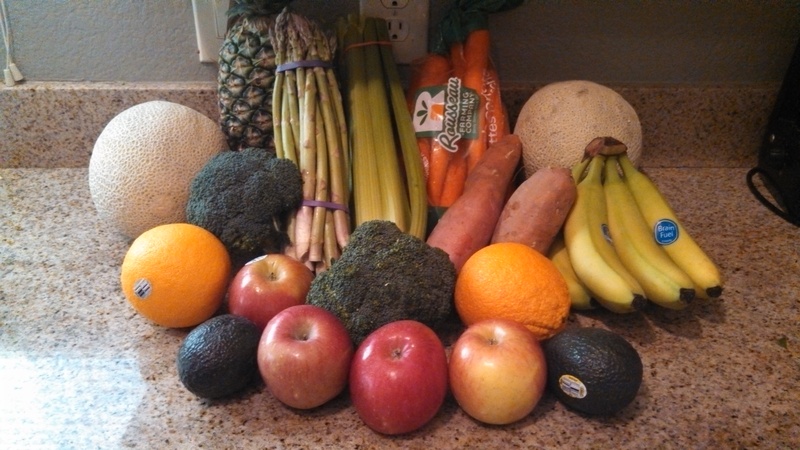 I have been stretching our grocery budget for a few years now. First thing to know for southeast AZ is that grocery store prices are very competitive. There are a lot of sales and the prices on some things are pretty reasonable, including produce. Second thing to know is that the sale cycle typically runs Wednesday through Tuesday. Finally, make sure to you have a store shopping card to get the sale prices. Here, we have a handful of places to find produce, the commissary on Ft. Huachuca, Walmart, Target, Food City, Fry’s, and Safeway. I’ve found quality-wise, my favorites are Fry’s and Safeway for produce. Plus, they have a wide selection, especially at Fry’s. Food City, Fry’s, and Safeway put out an ad weekly in the newspaper to tell you some of the sales, then in store there are usually some unadvertised sales as well. Not bad for my first try. If you take out the extra 3 lbs of strawberries, I’m just above $20 ($20.40 to be exact). Since the strawberries were cheap, I stocked up to put in the freezer for smoothies over the summer. The avocados have already been made into guacamole, the carrots and broccoli are for my daughter’s lunches. The cucumbers I will make into dill pickles, and the mushrooms and potatoes, possibly some baby carrots too, will go with a roast in the slow cooker. The oranges will get juiced with some grapefruit and minneolas I already have, the apples will be snacks, and the mangoes and strawberries will be blended into smoothies. That was all from last week’s ad, so now that it is Wednesday, there is a new ad. Today, a friend and I went to Fry’s and Safeway to see what we could put together with this week’s sales. 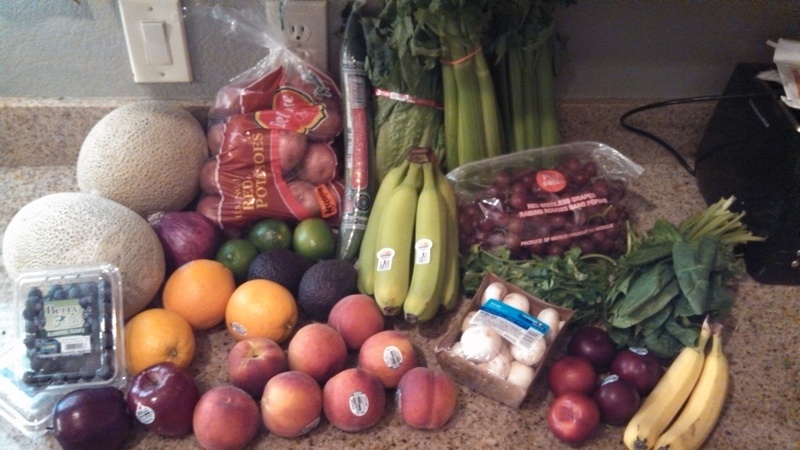 I did better this round, and I think I got a nice variety of produce. I also picked up more strawberries, because this week they have a 4 lb container of strawberries for $3.49 (limit of 2). That’s less than $1/lb, which is a great stock up price! Frozen strawberries aren’t quite the same as fresh, but they still make great smoothies and frozen lemon or lime-ade for summer. There are also other varieties of apples (fuji, red or golden delicious) for $0.99/lb, as well as other varieties of lettuce for $0.99/each (iceberg, Romaine, or red leaf). Zucchini and yellow squash is also $0.99/lb, but I’m already stocked well on that from Market on the Move (a new event in the area I have on the list to write about). Next, we headed to Safeway to check out the deals there. This one was a little tougher, the sales weren’t as good as Fry’s, but we still came out pretty well. Other items on sale include mangoes for $1/ea, 1 lb strawberries for $2.99, red seedless grapes for $2.99/ea, artichokes for $2.49/ea, grape tomatoes for $2/ea, red or green bell peppers for $0.99/ea, russet potatoes for $0.99/lb, organic red delicious or fuji apples for $1.49/lb, organic tomatoes on the vine for $2.69/lb, and organic mini watermelon for $4.69/ea. So, there are a few things you could swap out and still get the same total at the end. So, today, I stayed in the original goal of $15-$20, and I was able to make it a part of my weekly trip to the store to get my other basics, milk ($1.79 a gallon at both Fry’s and Safeway), eggs ($1.50/dozen at Fry’s) and cheese ($1.99 for sliced, $1.88 for shredded and blocks). Fry’s also has a Mega Sale right now where select items you get $5 off each set of 5 items you buy, mix and match on the deals. If you choose to shop at Safeway, they also have a deal today though Sunday that you get $10 reward coupon when you spend $75 or more in a single transaction. Make sure to sign up for just for U at Safeway to get coupons loaded onto your card for more savings. Fry’s is having a Cart Buster sale, and will have a Deal of the Day coupon available to load on your VIP card every day from February 29 – March 6. You can click on the link below to load the coupon for they day onto your card. Buy 4, Save $4, Tell 4, Save $4 More at Fry’s! I’m a couple days late on this, but I’m just getting through my e-mails after my travel home. This week at Fry’s (and Kroger family stores), there is a Buy 4, Save $4 sale on P&G products. If you Tell 4 friends, you get a $4 digital coupon loaded directly on to your VIP card to be used on your next shopping trip. So first, you go here and load a P&G coupon onto your VIP card. After you load it to you card, it will take you to a screen to enter in 4 names and e-mail addresses. After you enter those, it will load the $4 digital coupon VIP card. Thank you Fry’s for the $4! Fry’s Cart Buster Deal of the Day is Back! Fry’s Food Stores (and Kroger family stores too) is having a Cart Buster sale event now through December 13. You can go on the website to get a digital coupon that is the Deal of the Day for each day. After you load the Deal of the Day, if you e-mail at least 4 friends about the Deal of the Day promotion, you get a $2 digital coupon loaded on your Fry’s VIP card. You only get the $2 once, but $2 is a nice coupon to get! Starting today, November 20, 2011, though December 11, 2011, you will get 4X the fuel points when you buy gift cards at Fry’s. Perfect time to get gift cards for your Christmas gifts and get some rewards back for buying them. Or, go get them to do your holiday shopping. They have lots to choose from, and when they run a promo like this, I will go to Fry’s, get a gift card for the store I need to shop at, just to get the fuel rewards. There are some exclusions, the Kroger family of store gift cards and the prepaid generic cards are not eligible. But, if you are headed to lunch at Chili’s or need to pick up some things at Target, stop and get the gift card. Why get so many fuel points? For every 100 points, you get $.10 off per gallon of gas for 1 fill up (up to 35 gallons). Then, Fry’s is still running the promo to get up to $1 off per gallon (up to 35 gallons) at fuel centers at Fry’s stores. Buying 1 $25 gift card will get you $.10 off per gallon at a fill up, or buy 10 $25 gift cards to get $1 off per gallon at a fill up, or some number in between! So nice, since fuel is still fairly expensive. The Kroger family of stores is having a Cart Buster Savings Event. Each day of the sale, you can get a new digital coupon. Yesterday’s coupon was $2 off your purchase when you buy an 8 pack of Bounty paper towels. The Bounty paper towels are on sale for $6.99, so with the coupon, it made it $4.99. Today’s coupon is a free 12 pack of Pepsi Throwback or Mountain Dew Throwback when you buy 5 Pepsi 2 liters. Pepsi 2 liters are $1 each for the sale, so for $5, you get 5 1 liters and a 12 pack. At the bottom of the page, you can see what products will have coupons throughout the event, but the amount isn’t shown until the coupon come up for that day. You can only get the coupon for the day it is available, so remember to log in each day to get it. You can click on the picture above to take you to the Deal of the Day site to load the coupon each day.